The former British Prime Minister David Cameron attended an unscheduled meeting with the Korea–China Young Leaders Association’s Chinese entrepreneurs. The meeting took place on July 4 at the Seoul Walkerhill Hotel. 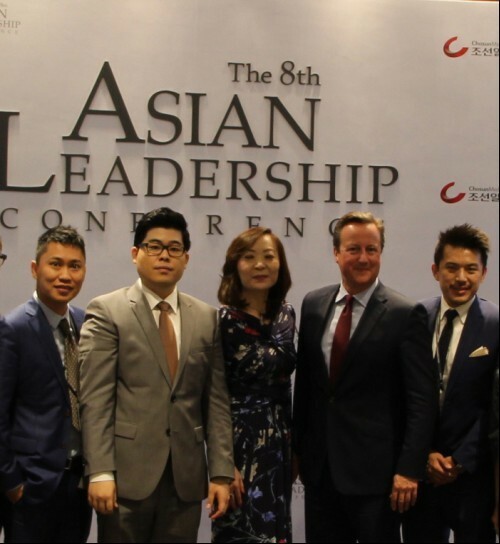 Cameron was invited as a speaker to the Asian Leadership Conference to Korea. Young Chinese entrepreneurs of Korea–China Young Leaders Association sent a message to Cameron requesting to meet him separately during the conference. Cameron graciously agreed and the meeting took place. From the seoncd left Scott Jeun, President of Korea-China Young Leaders Association; Jing Ulrich, Vice Chairman of JP Morgan APAC, David Cameron, Former Prime Minister of U.K; Nelson Loh, Chairman of Dorr Group. Although It was unscheduled private talk, the meeting itself was lively and engaging, organizers said. Jing Ulrich, managing director and vice chairman of Asia Pacific at JPMorgan, hosted the meeting. She said “It is an honor to host the meeting with Mr. David Cameron. I would also like to thank my friend Scott Jeun, president of Korea–China Young Leaders Association, for arranging this wonderful meeting.” The group of Young Chinese entrepreneurs included Zhang Qiang, president of Beijing Qunar Software Technology Ltd Co, who posed insightful questions to Cameron. The meeting ran about 30 minutes beyond the scheduled time. Zhang Qiang said, “Brexit is a new opportunity for both the UK and China. The UK and China should establish a growth-oriented relationship.” Qunar is China’s second biggest tourism company.